Nuzzled on the coast of the beautiful Cote d’Azur, with its historical centre, bustling markets and mild climate makes organising a school trip to Nice ideal. Nice is France’s fifth largest city, offering a variety of educational tour choices like churches with striking architecture, wonderful art galleries and museums like the Musée Matisse, located where the artist lived for much of his life. 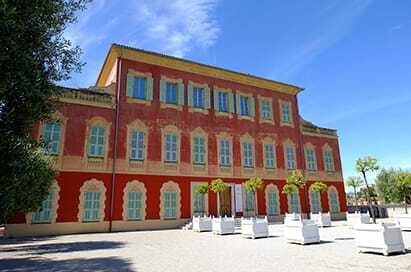 School trips to Nice offer a wide variety of experiences, perfect for any learning experience. Experience the sights and sounds of the capital of the French Riviera. A great way to get to know the city at a glance with a professional, experienced, English-speaking guide to give you an insight into the history and culture of the city as well as answer any questions you may have. This park, on a rocky outcrop above the old town, rewards with a cinematic panorama of Nice, the Baie des Anges and the port. Only the 16th-century Tour Bellanda remains of the 12th-century castle, razed by Louis XIV in 1706. The Cascade Donjon , an 18th-century artificial waterfall with viewing platform is a popular picnic spot. Hike up the steps from the seafront or ride the art deco lift to the top. The Matisse Museum is situated on the hill of Cimiez, not far from the Franciscan monastery with its Italianate gardens, the Hotel Regina where Matisse lived, and the Gallo-Roman ruins. Since the 5th of January 1963 the Museum has been welcoming visitors to its collection of works left by the artist (and his heirs) to the city of Nice where he lived from 1918 until 1954. The Domaine des Collettes and it's park adorned with olive-trees so beloved by the artist, was the last home of Auguste Renoir. Preserved with the original furniture and decoration, the house also features the painter's two studios, 11 original paintings, virtually all his sculpture, as well as many old photographs and personal possessions. The historic old town within the ramparts has retained much of its original character with quaint cobbled streets, a Provencal market, lots of restaurants and street cafes. The Chateau, bastion and towers have today been transformed into a magnificent Modern Art Museum, History and Archeology Museum and museum of traditional crafts and local culture. St Tropez on the Cote D'Azur was once home to painters and artists who valued the fact that it was the most inaccessible village on the coast. The town attracted the international "jet set" in the 1960s, and remains known for its beaches and nightlife. The cobblestoned La Ponche quarter recalls its past as a fishing village, although yachts now outnumber fishing boats in the Vieux Port.